Filmed over the last six months of the 2000 Presidential election, Phillip Seymour Hoffman starts documenting the campaign at the Republican and Democratic National Conventions, but spends more time outside, in the street protests and police actions than in the orchestrated conventions. BEFORE: The baseball chain is placed on rain delay for a while and a new chain takes its place. And that is a Philip Seymour Hoffman chain. 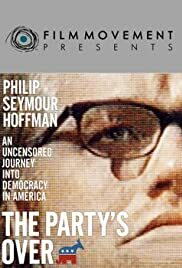 Last seen in Capote, Hoffman will be the star of the next five or six films (one is still questionable in the rotation) starting with tonight’s documentary The Party’s Over, which IMDb lists as Last Party 2000 for some reason. AFTER: There are many things this documentary did well but there is an overall sense of unprofessionalism (pretty sure that’s a word) in both look and tone. The Party’s Over has a very clear political message. While the message they try to get across is to have broader and more controversial discussions with other political viewpoints (there are interviews with Ralph Nader, Green Party/Independent candidate in many Presidential elections, and Gary Johnson who is the current candidate of the Libertarian Party), there remains a clear pro-Democratic Party bias. Not to say that’s a bad thing; many documentaries have biases because they want to persuade the viewers to think or react in a certain way. And the filmmakers try to do a good job balancing both sides with a large focus on the Republican side of the issues as well. But while there is an “A” for effort, the content grade suffers due to an unclear bias that seems to change throughout the documentary. The Party’s Over shows a lot of promise. There is some fantastic content and some great sound bytes littered throughout but the overall structure and organization of the content leads to an unclear and confusing message which in turn impacts the effectiveness of the documentary. This would be a great documentary to study and analyze of what the filmmakers did well and what they did poorly, but as an entertainment piece, I don’t see much value.